Don't forget to click 'Save' to pin for later! 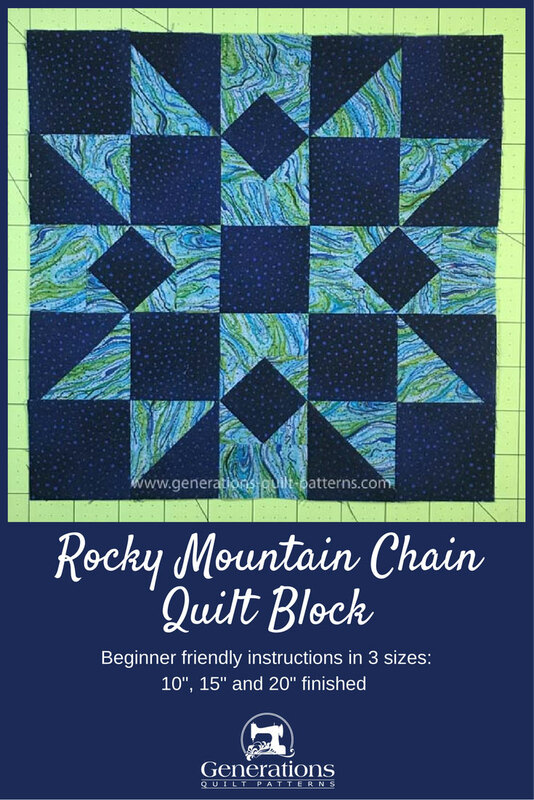 'There ain't no mountain high enough to keep me from' making the Rocky Mountain Chain quilt block! It's got so much quilty-goodness going for it. 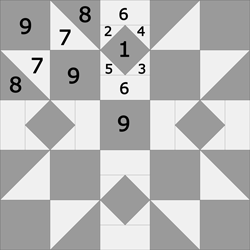 You have the opportunity to practice half square triangles and choose from two different Square-in-a-Square techniques. That's about all there is to it. Neither technique requires any special tools. 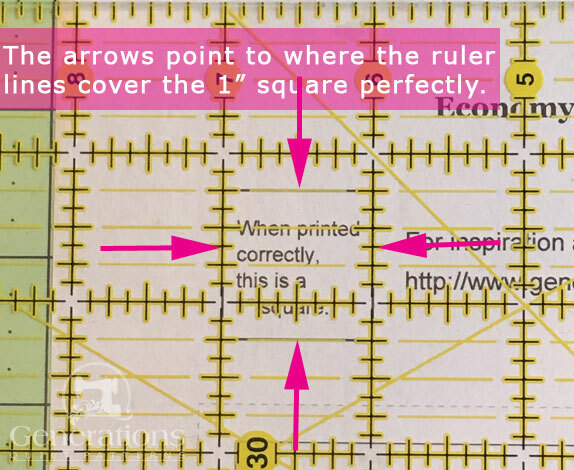 Each method to make the Square in a Square—either Connector Corners (sometimes called 'sew and flip') or paper piecing—has its own complete cutting chart. The different charts are color coded to make things easy for you to follow. Are you an experienced quilter? Got stash? Flirting with hoarder status? This Rocky Mountain Chain might just be your solution. Quarter inch seam allowances (SA) are used throughout. Press seams to the dark unless otherwise instructed. You'll see me switch back and forth between presser feet. An open toe applique foot for the HST and paper piecing the SiaS is 'Da Bomb'—making it so easy to see where you're stitching. For sewing the patches together it's back to your favorite 1/4" presser foot. My favorite has a rigid guide on the right-hand side. It's particularly helpful when I'm suffering through a serious case of brain-fart-itis-maximus. (No amount of Excedrin can cure that!) And I most certainly was during the construction of the sample. As they say, there's more than one way to skin a cat—and there's always more than one way to make a quilt block. Two different cutting charts are shared below. The blue one uses traditional piecing methods and connector corners. The yellow one uses traditional techniques plus some paper piecing for the SiaS units. Choose whichever method works best for you. Or try a new one and grow your piecing skills. In both charts the measurements for the HST units are generous. Those units will be trimmed to perfection after stitching. All the fabrics used were starched before cutting. Starch makes finger pressing easier, and in my humble opinion, cutting and sewing more accurate. To try starching for yourself, click here for helpful tips and instructions. Choose either Option #1 or #2 below. 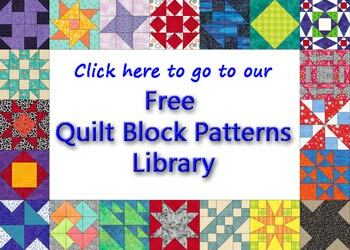 Select your block size, fabrics and cut. There is no pattern to download. 1*	 D	 4 2-1/2"	x	2-1/2"	 3-1/2"	x	3-1/2"	 4-1/2"	x	4-1/2"
4* 5*	 L	 16 1 1/2"	x	1 1/2"	 2"	x	2"	 2 1/2"	x	2 1/2"
6	 L	 8	 1 1/2"	x	2 1/2"	 2 "	x	3 1/2"	 2 1/2"	x	4 1/2"
7	 L	 1	 6 1/2"	x	6 1/2"	 8 1/2"	x	8 1/2"	 10 1/2"	x	10 1/2"
8	 D	 1	 6 1/2"	x	6 1/2"	 8 1/2"	x	8 1/2"	 10 1/2"	x	10 1/2"
9	 D	 9	 2 1/2"	x	2 1/2"	 3 1/2"	x	3 1/2"	 4 1/2"	x	4 1/2"
Unfinished Block Size	 10 1/2"	 15 1/2"	 20 1/2"
Grid Size	 2"	 3"	 4"
Choose your finished Rocky Mountain Chain block size from the list below. 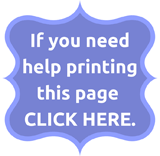 Download and print the copies needed to make a block. Now cut the patches for the block. 1*	 D	 4	 1 7/8"	x	1 7/8"	 2 5/8"	x	2 5/8"	 3 3/8"	x	3 3/8"
4* 5*	 L	 8	 2 3/8"	x	2 3/8"	 2 7/8"	x	2 7/8"	 3 3/8"	x	3 3/8"
6	 L	 8	 2"	x	2 1/2"	 2 "	x	3 1/2"	 3"	x	4 1/2"
NOTE: If you were wondering, under the patch dimensions for the 20" block, both the #1 and the #2-#5 patches are cut 3-3/8" x3-3/8". That is correct—not a typo. 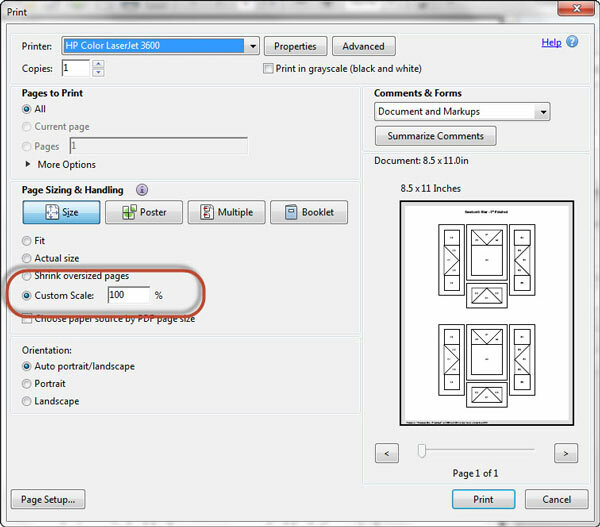 You chose your preferred method to make the Square in a Square (SiaS) units and then cut those patches in Step 1. Now choose the corresponding instructions below to make these units. ﻿Click here for instructions to make this unit with the connector corner technique. When finished click the back button on your browser bar to return here. For more detailed instructions using this method click here. 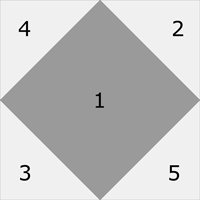 Before doing anything else, subcut the eight squares for Patches 2-5 in half diagonally once to form 16 right triangle shapes. 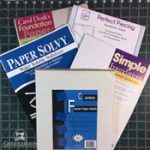 From the paper pattern you downloaded in Step 1, cut out the four units. Don't bother to trim exactly on the dashed line—a rough cut just outside the dashes is good enough for now. Reduce your stitch length to 1.2mm to 1.5mm or 15-20 stitched per inch. An open toe applique foot is perfect for this stitching because you can see the sewing line. 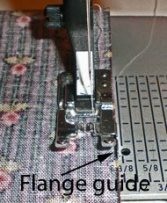 Its edges should extend approximately 1/4" past the solid stitching line (below). Notice how I didn't bother to cut the pattern exactly on the dashed lines. Everything gets trimmed neatly at the end—even the thread tails! With right sides together (RST) add the corner patches (2, 3, 4, and 5) in numerical order. 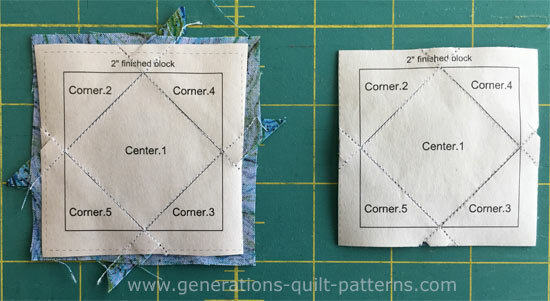 For the larger size blocks, you may be able to a pair of opposite corners before pressing. Align the long edge of a corner patch with the cut edge of #1. Stitch—starting and stopping past the outside dashed line of the unit. It's important to start and end your stitching past the outside edges of your block. Because my fabric was heavily starched before cutting, the seams could be finger-pressed open instead of jumping up and down to the iron between patches. In the images below, on the left you can see how the #4 patch is positioned before stitching. On the right after stitching #5, you can see where the dog ear is trimmed away (blue arrow). Trim away all the dog ears to reduce bulk and neaten up your patchwork. Don't worry about the thread tails—they'll be taken care of with the final trim. 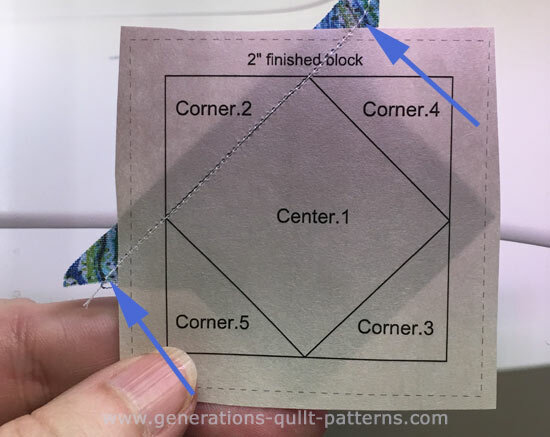 Now give your unit a quick press checking that there are no tucks at the seam lines. Trim to size with your rotary cutter and ruler. Any straggly thread tails are removed with this trimming. regardless of which cutting chart you used. 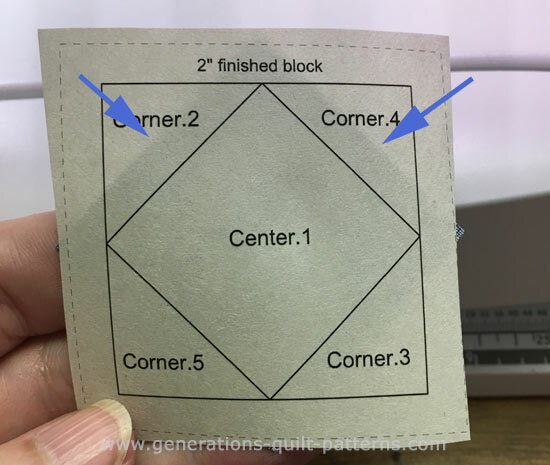 Click here to go to the next step to make this block. Rocky Mountain Chain, Pt 1.